Captain Genty, considered to be the inventor of the armored car in France, was summoned by General Hubert Lyautey to Morocco, where the political situation was deteriorating. 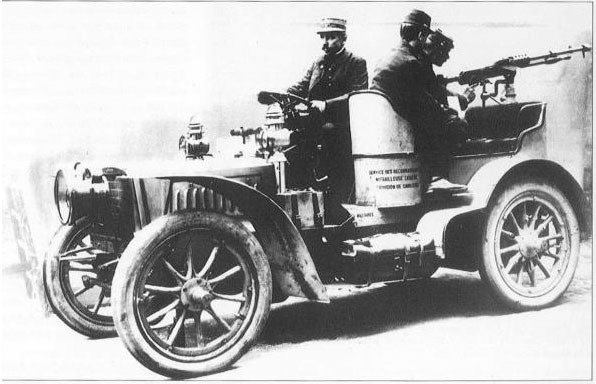 Captain Genty left Paris on 7 December in his armored car and arrived on 18 December 1907. Captain Genty at the wheel of the 24 hp Panhard-Genty armored car, which could travel at a speed of 70 kph. In 1904, the army assigned Captain Genty a Panhard & Levassor 24 hp car which could be used as a reconnaissance vehicle because its high chassis enabled it to travel over rugged terrain. Its impact-resistant reinforced-wood frame gave it flexibility and solidity and it could travel at a speed of up to 70 kph. Genty had the idea of adding a machine gun and fitting out the vehicle accordingly. The bucket seat next to the driver had a swivel stool so that the gun could be fired from any position. The Panhard-Genty armored car was the first in a long line of Panhard army vehicles.